Hey everyone! As promised, I've posted the video of Marina Sirtis, best known for her role as Counselor Deanna Troi on Star Trek: The Next Generation, during her panel at ConnectiCon 2013 on July 13 in honor of YouTube's Geek Week! Ms. Sirtis talks about her experience with the show, the movies, crashing the Enterprise, bad wigs, and even does a hilarious impression of Patrick Stewart. 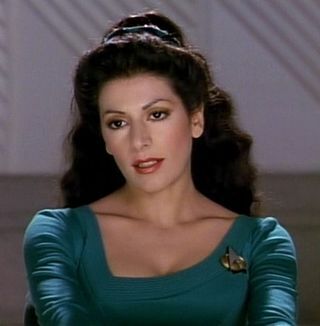 Witty, outspoken, and hilarious, Ms. Sirtis proves herself to be far more than her reserved, demure Troi portrays, and all the while doing it in great shoes.